Less choice and a shorter lifespan means that RPGs don't have to worry as much about getting out of each other's way. Halo and Call of Duty might duke it out for hearts, minds, and most importantly, sales, but you're unlikely to see RPGs doing the same. That's the view of Jan Bartkowicz, a scriptwriter for Witcher 2 developer CD Projekt, who thinks that RPG fans will buy whatever they can get their hands on. He said that as RPGs tended to be single player games, they didn't have the months and months of playtime that games with a strong multiplayer mode did and that because the RPG genre was relatively small, fans either played pretty much everything that came out, or else they played almost nothing at all. He thought that the RPG development community was closer, because developers weren't as worried about losing their audience to another game. "[Y]ou're not going to get that many games," he said. "So you're not considering, 'Is it going to be Fallout 3 for me or The Witcher?' You're probably going to play both ... That's why I think our little RPG genre family is more tight, because we're not looking at each other thinking, 'Argh, they're going to steal our gamers!'" There's a lot of truth in what Bartkowicz is saying. You might pick one first person shooter over another because all your friends are playing it, but that just isn't going to happen with a single player RPG. That's not say that there's no competition at all - I'd be amazed to see The Witcher 2 come out in the same month as Dragon Age 2 - but space the releases out properly and there's not too much to worry about. 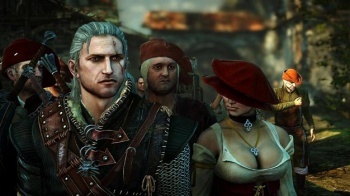 The Witcher 2 is due to be released early next year.